It’s fair to say that most professionals are proud of their achievements, especially when their names include titles they worked hard for over the years. 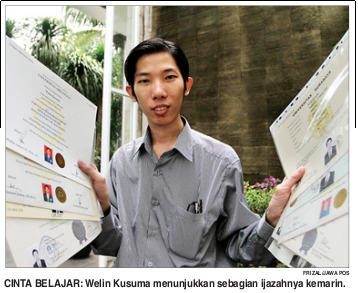 For Welin Kusuma, it’s hard for him to write his name, but only because he takes pride in writing his full name along with all his honorary achievements, which takes up three lines and incorporates 19 titles. Yes, you read that right. He has 19 titles, specifically eight bachelor’s degrees, three master’s degrees, and eight professional titles. His whole name reads Welin Kusuma ST, SE, SSos, SH, SKom, SS, SAP, SStat, MT, MSM, MKn, RFP-I, CPBD, CPPM, CFP, AffWM, BKP, QWP. One might think that he has spent his whole life studying. However, Welin, 31, spent only 13 years earning all of his titles. Well, he took classes in parallel, spending the whole day running from one university to the other. There were times when studying got hard for him. He received warnings for taking courses for longer than the normal time that is recommended, and he also had classes whose times overlapped. However, he didn’t let these obstacles hinder him from achieving so much. When asked why he studied so much, his answer was that he dreamed to be an integrated consultant who can provide many perspectives to his clients. “My professional degrees are related to management, finance, and taxation,” he explained. Even though he focused much on the management field, he studied law and engineering to equip his clients with more information. He also wasn’t that much of a burden on his parents since he paid for his own education in 2004. As of today, he is a tax consultant because of his BKP degree. However, his real work is in the information systems (IS) field. Genevieve Baxa is a college student living in the Philippines. She has a great passion in writing, especially in writing short stories. This unpredictable lady loves everything about East Asia. She is enthralled by the culture and fashion of these countries. She also loves everything about children; teaching them; taking care of them; and playing with them. In addition to that, Genevieve especially loves to go on Mission Trips and serving different kinds of people. Above everything else, she is a lady who fears her God.